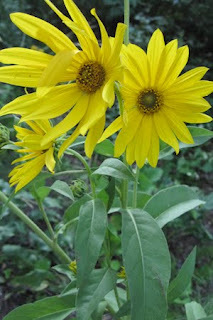 Maximilian Sunflower is flowering earlier than usual in our yard this year (along with many other species). It is a tall 4 - 8 foot perennial forb with bright yellow flowers arranged on short alternating stems arising from the leaf axils. Its usual flowering time in Minnesota is September through October. I have seen it flowering into late October producing seeds into early winter that are sought out by birds, especially goldfinches and chickadees. 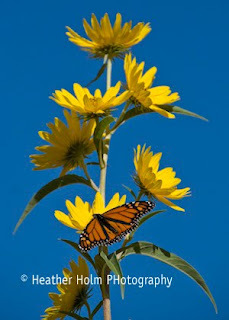 It also provides a nice amount of nectar for butterflies who are preparing for their southerly migration. It is native throughout much of North American except for the Canadian maritime provinces and northern territories. It prefers a medium to heavy soil that is moderately moist. More information about growing Maximilan Sunflower in the USDA Plant Guide.